HIGHLIGHTS: Savannah Portage was a vital land link between the St. Louis River and the Mississippi River watersheds and it was used for centuries by the native Americans before the white man arrived in mass in the 1760’s to trade furs. The portage joined the heavily traveled canoe route from Lake Superior to the Upper Mississippi via a savannah, which means open grassland with an expanse of marsh grass. 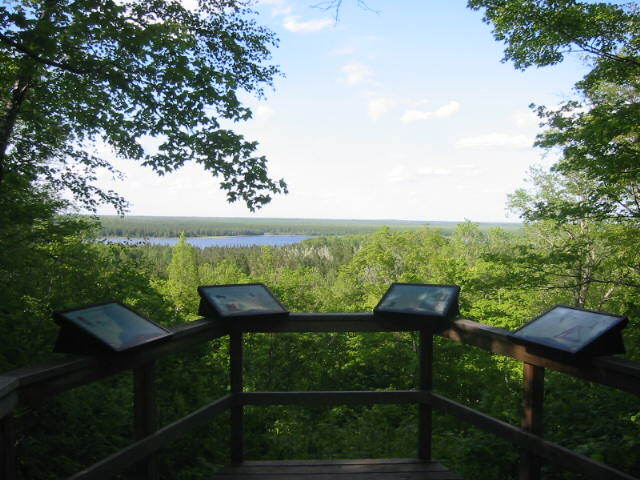 Savannah Portage State Park is named for this six mile portage and it has a system of trails and backcountry campsites within its boundaries. This hike follows the Continental Divide in the park and the trail has outstanding views of Wolf Lake from a platform on the ridge. It is along this route that the continental divide separates the drainages of the Gulf of Mexico and the Atlantic Ocean, and this information is well documented on the hike.